Textiles are usually coloured to make them attractive for aesthetic appeal. There are two ways of adding colour to a textile substrate-printing and dyeing. Printing adds colour to the surface in discrete places, whereas dyeing completely covers the substrate with colour. Dyeing is the process of imparting colors to a textile material through a dye (colour). Dyes are obtained from flowers, nuts, berries and other forms of vegetables and plants as well as from animal and mineral sources. These are known as natural dyes. The other class of dyes is known as synthetic dyes. These are based on a particular type of chemical composition. Some of these dyes are- Acid (Anionic) dyes, Basic (Cationic) dyes, Neutral- Premetalized dyes, sulfur dyes, vat dyes, reactive dyes, pigment dyes etc. There are three terms generally used to describe and specify colour. These are hue, value and chroma. Hue: hue is a term used for color, for example, pink, mauve, scarlet, beige, tan, etc are hues. Value: value is a term used to describe lightness, darkness, tone or shade of hues. A colour is termed light in value when it approaches white and dark in value when it has a deep colour or approaches black. Chroma: chroma is the term used to describe the depth of colour that is the dullness, brightness, saturation, intensity, vividness or purity of colour. A bright, intense colour is said to have high chroma. The rainbow: Sunlight is generally accepted as the source of white light and it consists of the seven colours of rainbow. These are violet, blue, blue-green, green, yellow, orange and red. Additive colour mixing occurs when two or more lights mix together. Subtractive colour mixing occurs when colourants are mixed together. Additive colour mixtures are always lighter than any of the individual components since each light adds luminous energy to the final mixture. Blue, green and red light waves when mixed will add together to produce white light. Red, blue and green are called the primary additive colours. Knowledge of additive colour mixing is necessary to understand subtractive colour mixing which is utilized in textile dyeing and printing. The primary additive colours are also the basis of colour specification. Inorganic pigments, such as various metallic oxides, hydroxides, chromates or other salts, are mostly used for paints and similar colour preparation. Organic pigments, such as insoluble azo or polycylic keto compounds, are mostly applied on textiles. Toners are sparingly water soluble azo compounds precipitated as barium, calcium or magnesium salts. Lakes are water-soluble dyes precipitated as metallic salts. Complex of basic dyes with selected inorganic acids such as phosphomolybdic acid, phosphotungstic acid and phosphomolybtungstic acid resulting in fluorescent pigments which are used for printing of textiles and for making poster or signal colours. Metallic co-ordination complexes of organic compounds, e.g. copper phthalocyanine. Solubility in water, either permanently or temporarily during dyeing. Affinity or substantivity towards textile fibres so that they are absorbed and retained by them. Reactivity of certain dyes with fibres assures firm retention. Adequate fastness, i.e. ability to withstand the treatments which the textile materials undergo in manufacturing processes and in normal use. The wet processing sector can be divided into three distinct sections: preparation processes, colouration processes, finishing process. These are shown in the following table. These processes ensure that textiles have the right physical and chemical properties to enable them to be coloured or finished. These processes exist to provide the textile with coloured either for aesthetic reasons or for some functional purpose determined by the product. These processes exist to provide the textile with the properties that end use demands and which have not already been provided by any earlier processes. 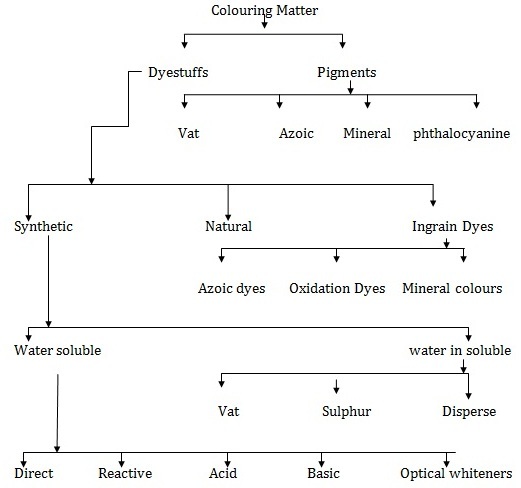 Properties of the coloured substance. Properties of our eyes, on which the reflected/transmitted light falls. The sun is the main and most important source of energy in our solar system. It emits energy in the form of light. The light travels in the form of waves at tremendously high velocity i.e. 3*10⁸ m/s. It has been established that coloured compounds must contain unsaturated chemical groups, which are known as “chromophores” or colour bearing groups. A compound containing a chromophore is known as chromogen. There are certain colour helping or colour intensifying groups known as auxochromes. -OH; -NH₂ ;-COOH;-SO₃H;-OSO₃H;-NR₂; -NHR etc. Polyester: -OH, -COOH. No ionization effect, high temperature used for dyeing with dispersing. Synthetic dyes are classified based upon their chemical composition and the method of their application in the dyeing process. Basic (Cationic) dye are water-soluble and are mainly used to dye acrylic fibers. They are mostly used with a mordant. A mordant is a chemical agent which is used to set dyes on fabrics by forming an insoluble compound with the dye. With mordant, basic dyes are used for cotton, linen, acetate, nylon, polyesters, acrylics and modacrylics. Other than acrylic, basic dyes are not very suitable for any other fiber as they are not fast to light, washing or perspiration. Thus, they are generally used for giving an after treatment to the fabrics that have already been dyed with acid dyes. The modified basic dyes called pendant cationic dyes were developed by separating ionic changes away from the chromophore. These dyes have superior light fastness. Direct dyes have direct Substantivity to cellulosic materials and are also termed as Substantivity dyes. They are used for dyeing wool, silk, nylon, cotton, rayon etc. These dyes are not very bright and have poor fastness to washing although they are fairly fast to light. The mordant or chrome dyes are acidic in character. Sodium or potassium bichromate is used with them in the dyebath or after the process of dyeing is completed. This is done for getting the binding action of the chrome. They are mostly used for wool which gets a good color fastness after treatment with mordant dyes. They are also used for cotton, linen, silk, rayon and nylon but are less effective for them. Vat dyes are insoluble in water and cannot dye fibers directly. However, they can be made soluble by reduction in alkaline solution which allows them to affix to the textile fibers. Subsequent oxidation or exposure to air restores the dye to its insoluble form. Indigo is the original vat dye. These dyes are the fastest dyes for cotton, linen and rayon. They are used with mordants to dye other fabrics such as wool, nylon, polyesters, acrylics and modacrylics. Reactive dyes react with fiber molecules to form a chemical compound. These dyes, they are either applied from alkaline solution or from neutral solutions which are then alkalized in a separate process. Sometimes heat treatment is also used for developing different shades. After dyeing, the fabric is washed well with soap so as to remove any unfixed dye. Reactive dyes were originally used for cellulose fibers only but now their various types are used for wool, silk, nylon, acrylics and their blends as well. Depending on the reactive group these dyes are classified into a number of subgroups, namely cold-brand (M-brand), remazol (Vinyl sulphone), high-exhaust (HE- brand), etc. Disperse dyes are water insoluble. These dyes are finely ground and are available as a paste or a powder that gets dispersed in water. These particles dissolve in the fibers and impart color to them. These dyes were originally developed for the dyeing of cellulose acetate but now they are used to dye nylon, cellulose triacetate, and acrylic fibers too. 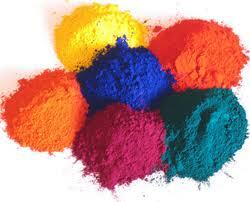 Sulfur Dyes are insoluble and made soluble by the help of caustic soda and sodium sulfide. Dyeing is done at high temperature with large quantities of salt so that the color penetrates into the fiber. After dyeing, the fabric is oxidized for getting desired shades by exposure to air or by using chemicals. Excess dyes and chemicals are removed by thorough washing. These dyes are fast to light, washing and perspiration and are mostly used for cotton and linen. Although pigments are not dyes in a true sense, they are extensively used for coloring fabrics like cotton, wool and other manmade fibers due to their excellent light fastness. They do not have any affinity to the fibers and are affixed to the fabric with the help of resins. After dyeing, the fabrics are subjected to high temperatures. As fibre vary considerably in chemical structure and as dyes too have different chemicals groups that are characteristic of them, it can be easily understood that all dyes will not have the same affinity for all fibres. It is the difference between the chemical potential of dye in its standard state in the fiber & the corresponding chemical potential in the dye bath i.e. tendency of a dye to move from dye bath into a substance. It is expressed in Joule or cal (per mole) and quantitative expression of substantivity. Cellulosic (cotton and viscose): Direct, azoic, sulphur, vat, solubilised vat, reactive, ingrain, mineral, pigment, oxidation colours(limited use). Cellulosic(Jute): Most of the above classes except those require causic soda. Additionally acid and basic dyes. Protein (wool,silk, nylon): Acid and selected direct dyes, basic dyes(limited use). Polyester, Cellulose acetate and less commonly nylon: Disperse dyes. Acrylic and Modacrylic: Conventional and modified basic dyes. The attraction between a substrate and a dye or other substance under the precise condition of test whereby the test is selectively extracted from the application medium of substrate. It is the qualitative expression of affinity. Substantivity depends on temperature, type of fiber, electrolyte concentration. Substantive dyes have affinity and are soluble. In simple terms Substantivity indicates the ability of a dye to go to from the solution phase to the fibre. This is a measure of the proportion of the dye absorbed by the fibre in relation to that remaining in the dye bath. Thus it indicates the amount of dye that has moved from the solution into the fibre under given dyeing conditions. It is also a measure of the Substantivity of the dye for the fibre. This expression refers to the weight volume relationship between the fibre to be dyed and the total volume of dye bath. It is normally abbreviated as MLR and sometimes written as M:L ratio. An M:L ratio 1:20 means that a dye bath volume of 20 litres is required to dye 1 kg of dye fibre. The material to liquor ratio is also sometimes referred to as an inverse ratio and called the “liquor to goods ratio” or simply the “liquor ratio” and this ratio is given by the following expression. In all the liquor circulating machines like kier, jet dyeing and cheese dyeing machines the M:L ratio is 1:4 or 1:5. In a jigger it is 1:4. In padding machine it is 1:1. In a winch machine it is the range 1:10 to 1:25. In open beck the ratio would be 1:20 to 1:40. Expression: the term expression indicates the percentage increase in the weight of dry fabric after padding. Shade percentage: shade percentage refers to the quantity of dye taken for a dyeing expressed as a percentage of the dry weight of the fibre to be dyed. Dyeing assistants: Dyeing assistants are chemicals that facilitate in one way or another, the production of the required shades in dyeing. They also called auxiliaries. Some typical dyeing assistants are: water softening/sequestering agents, exhausting agents, dispersing agents, leveling agents, retarding agents, anti foaming agents, etc. Fixation or anchoring of the dye molecule at a suitable location or dye site. In the first phase or step the dye molecules in the dye bath move towards the fibre and those that are nearest to the fibre get adsorbed on to the fibre surface. They form a very thin layer of molecules on the fibre surface. Other dye molecules still in the dye bath can be adsorbs only if this adsorbed layer moves further into the fibre. In the second step, the adsorbed dye molecules enter the fibre structure and gradually penetrate or diffuse into the pores or canals in the structure. The rate of penetration and the depth to which they get will depend upon the molecular characteristics of the dye, the molecular arrangement in the fibre and the dyeing conditions. Diffusion or penetration of dye in the fibre accounts for almost the whole of dyeing time. The greater the penetration of dye into the fibre the brighter and better is the dyeing. Good penetration is thus the key to quality dyeing. Poor penetration results in dull, surfacial dyeing with unsatisfactory colour fastness properties. The final step is one where the dye molecules find suitable locations or dye sites, where they get fixed or anchored. The forces by which the dye molecules are held thus inside the fibre vary in nature and strength and depend upon the dye-fibre relationship. Mass pigmentation of polymer melt or solution. Dyeing of fibre top or sliver. Requirement of dyes of high quality. Poor flexibility to trade demands. Requirement of large lots per colour. 10% less dye cost than gel dyeing, more flexibility of choice of dyes. Moderate flexibility to trade demands. Comparatively smaller lots per colour, e.g. 2.5 tons. Lowest dye cost, maximum choice of dyes. Maximum flexibility, rapid response to market. Requires maximum levelness of dyeing. Color is applied to fabric by different methods and at different stages of the textile manufacturing process. Stock dyeing is used to dye fibers. In this process, the staple fibers are packed into a vessel and then dye liquid is forced through them. Although the dye solution is pumped in large quantities, the dye may not penetrate completely into the fibers and some areas may be left without dyeing. However, the following blending and spinning processes mix up the fibers in such a thorough way that it results in an overall even color. Woolens are usually stock dyed. Top is the combed wool sliver. It is wound on perforated spools and the dye solution is circulated through it. This method results in very even dyeing. When dyeing is done after the fiber has been spun into yarn, it is called yarn dyeing. In this method, the dyestuff penetrates the fibers to the core of the yarn. There are many forms of yarn dyeing- Skein (Hank) Dyeing, Package Dyeing, Warp-beam Dyeing, and Space Dyeing. The yarns are loosely arranged in skeins or coils. These are then hung over a rung and immersed in a dye bath in a large container. In this method, the colour penetration is the best and the yarns retain a softer, loftier feel. It is mostly used for bulky acrylic and wool yarns. The yarns are wound on spools, cones or similar units and these packages of yarn are stacked on perforated rods in a rack and then immersed in a tank. In the tank, the dye is forced outward from the rods under pressure through the spools and then back to the packages towards the center to penetrate the entire yarn as thoroughly as possible. Mostly, the carded and combed cotton which are used for knitted outerwear is dyed through this method. It is similar to package dyeing but more economical. Here, the yarn is wound on to a perforated warp beam and then immersed in a tank for dyeing it applying pressure. In this method, the yarn is dyed at intervals along its length. For these two procedures- knit- deknit method and OPI Space-Dye Applicator- are adopted. In the first method, the yarn is knitted on either a circular or flat-bed knitting machine and the knitted cloth is then dyed and subsequently it is de-knitted. Since the dye does not readily penetrate the areas of the yarn where it crosses itself, alternated dyed and undyed spaces appear. The OPI Space-Dye Applicator technique produces multi coloured space- dyed yarns. The yarns are dyed intermittently as they run at very high speeds through spaced dyebaths. They are continuously subjected to shock waves produced by compressed air having supersonic velocities. The constructed fabrics are piece dyed for the flexibility they provide. The textile manufacturer can dye the whole fabric in batches according to the fashion demands of the time thus avoiding wastage and resultantly loss. There are several methods prevalent or piece dyeing. Padding is also done while holding the fabric at full width. The fabric is passed through a trough having dye in it. Then it is passed between two heavy rollers which force the dye into the cloth and squeeze out the excess dye. Then it is passed through a heat chamber for letting the dye to set. After that it is passed through washer, rinser and dryer for completing the process. Fabric is placed in a heated tube where jets of dye solution are forced through it at high pressures. The fabric too moves along the tube. The solution moves faster than the cloth while coloring it thoroughly. This is a method applied for dyeing the synthetic fibers. Dye is added to the solution before it is extruded through the spinnerets for making synthetic filaments. This gives a colorfast fiber as the pigments are used which are the fastest known colors. When the finished textile product such as hosiery or sweaters are dyed, it is called garment dyeing. A number of garments are packed loosely in a nylon net and put into a dyestuff filled tub with a motor driven paddle. The dye is thrown upon the garments by the moving paddles' effect. Textile preparation and dyeing by Ashim Kumar Roy. Modern concepts of color and appearance by Ashim Kumar Roy. Kulkarni. S. V. et al. Texrile Dyeing Operarions. Noycs Pulbications, Park Ridge. N. J., 1986. A Review of Textile Dyeing Processes by WARREN S. PERKINS, Department of Textile Engineering, Auburn University, Auburn, Ala.